Collagen is a member of a family of naturally occurring proteins. It is one of the most plentiful proteins present in mammals, and it is responsible for performing a variety of important biological functions. It is most well-known for the structural role it plays in the body. Collagen is present in large quantities in connective tissue and provides tendons and ligaments with tensile strength, and skin with elasticity. It often works in conjunction with other important proteins, such as keratin and elastin. About one-quarter of all of the protein in your body is collagen. Collagen is a major structural protein, forming molecular cables that strengthen the tendons and resilient sheets that support the skin and internal organs. Bones and teeth are made by adding mineral crystals to collagen. Collagen provides structure to our bodies, protecting and supporting the softer tissues and connecting them with the skeleton. But, in spite of its critical function in the body, collagen is a relatively simple protein. Each fiber of collagen contains thousands of individual collagen molecules that are bound together by cross-linking and staggered covalent bonds. Covalent bonds are the strongest bonds that can exist among protein molecules. The collagen molecules themselves are made from 3 individual polypeptides or strings of amino acids. The strands wind around one another in an alpha-helix. The helix forms because of the regular amino acid sequence of the strands. The sequence is a repeating pattern of glycine-proline-X, where X can be any amino acid. A special amino acid sequence makes the tight collagen triple helix particularly stable. Every third amino acid is a glycine, and many of the remaining amino acids are proline or hydroxyproline. A classic triple helix is shown here in the image. 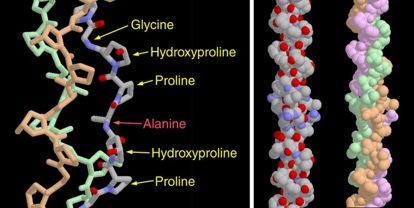 Notice how the glycine forms a tiny elbow packed inside the helix, and the proline and hydroxyproline smoothly bend the chain back around the helix. In this structure, the researchers placed a larger alanine amino acid in the position normally occupied by glycine, showing that it crowds the neighboring chains. 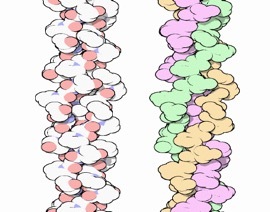 The collagen helix shown on the right contains a segment of human collagen. Notice that the top half is very uniform, where the sequence is the ideal mixture of glycine and prolines. At the bottom, the helix is less regular, because many different amino acids are placed between the equally-spaced glycines. Twenty-eight different types of collagen have been identified in vertebrates. Collagen types I to IV are the most prevalent. The unique properties of each type are due to segments in the collagen molecules that disrupt the helical structure. These are caused by the amino acids in the X positions of the polypeptide sequence. Different tissues of the body contain different amounts of each type of collagen. For example, cartilage contains a lot of type II, whereas type IV is mostly found in basement membranes. Hydroxyproline, which is critical for collagen stability, is created by modifying normal proline amino acids after the collagen chain is built. The reaction requires vitamin C to assist in the addition of oxygen. Unfortunately, we cannot make vitamin C within our bodies, and if we don’t get enough in our diet, the results can be disastrous. Vitamin C deficiency slows the production of hydroxyproline and stops the construction of new collagen, ultimately causing scurvy. The symptoms of scurvy – loss of teeth and easy bruising – are caused by the lack of collagen needed to repair the wear-and-tear caused by everyday activities. A number of diseases are associated with collagen abnormalities or damage. These can be acquired or caused by a genetic mutation. Ehlers-Danlos syndrome is a genetic disease that results in abnormal collagen production. Symptoms include bruising and hyperelasticity of the skin. Scurvy is an acquired collagen-associated disease caused by vitamin C deficiency. Vitamin C is needed to produce the essential amino acids used to make collagen. Without it, collagen fibers cannot be repaired, and blood vessels, tendons, and bones become fragile. Collagen from livestock animals is a familiar ingredient in cooking. Like most proteins, when collagen is heated, it loses all of its structure. The triple helix unwinds and the chains separate. Then, when this denatured mass of tangled chains cools down, it soaks up all of the surrounding water like a sponge, forming gelatin. We make many different kinds of collagen which form long ropes and tough sheets that are used for structural support in mature animal,s and as pathways for cellular movement during development. All contain a long stretch of triple helix connected to different types of ends. The simplest is merely a long triple helix with blunt ends. These ‘type I’ collagen molecules associate side-by-side, like fibers in a rope, to form tough fibrils. 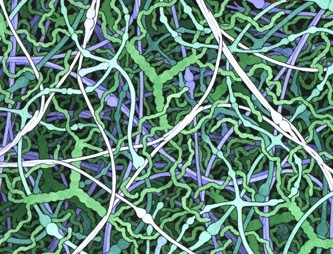 These fibrils crisscross the space between nearly every one of our cells. This illustration depicts a basement membrane, which forms a tough surface that supports the skin and many organs. A different collagen – ‘type IV’ – forms the structural basis of this membrane. Type IV collagen has a globular head at one end and an extra tail at the other. The heads bind strongly together, head-to-head, and four collagen molecules associate together through their tails, forming an X-shaped complex. Using these two types of interactions, type IV collagen forms an extended network, shown here in light blue. Two other molecules – cross-shaped laminin (blue-green) and long, snaky proteoglycans (green) – fill in the spaces, forming a dense sheet.